With the introduction of Bushfire Construction regulations, Barwon Timber sought out a quality timber suitable for areas in Bushfire zones, Spotted Gum proves to be an excellent choice as it is readily available, suitable for many BAL29 applications, has excellent long term durability and in many eyes a beautiful grain and colour. 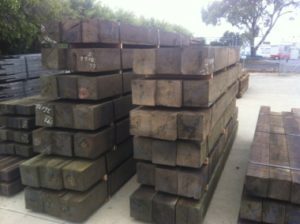 We have a wide range of spotted gum available for residential and commercial construction, our Spotted Gum Posts (as pictured on left) are treated to H4 & also F14 appearance grade, our Spotted Gum Beams are treated to H3, we also have the option available for rough sawn Spotted gum Posts & Beams for that rustic look. If you are looking for a specific size in Spotted Gum we can machine to order dressed beams, the constant turnover of our Spotted Gum ensures we have new Spotted Gum available at all times. The majority of our stock Spotted Gum is sourced from Queensland. We stock a wide range of sizes in rough sawn material as pictured below. Spotted gum varies in appearance but not in durability class or other properties (class 1 above ground & class 2 in ground). The heartwood ranges from light brown through to dark red-brown hues. Sapwood is usually white to light brown in color. The presence of a wavy grain can produce an attractive fiddle-back figure. The wood has a slightly greasy feel, a characteristic that aids machining and boring. Spotted Gum components that are 18mm thick or greater do not require fire retardant treatment for use in construction in bush-fire prone areas. If you would like more information on our Spotted Gum products, please contact our timber office or Showroom. Hello, where can these timbers be purchased? And, do you know how much they are?